Since we reviewed the Mazda2 last year, the sub-compact car segment has blossomed into a vastly competitive field with no fewer than 10 entries worthy of your consideration, thanks in part to our revived desire for smaller vehicles with better fuel economy. 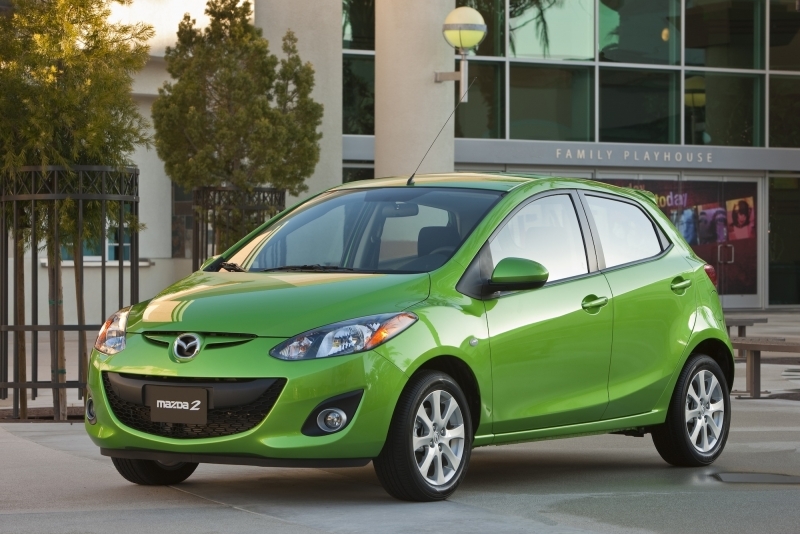 The 2012 Mazda2 is Mazda’s answer to this growing demand. The Mazda2 is a true sub-compact, shorter than the Honda Fit, Nissan Versa and Ford Fiesta, and brings with it driving dynamics befitting a company that prides itself on its racing tradition. Yep, you heard right, the Mazda2 is a B-car that drives well. And it’s a good thing that it does, because that – and the nearly $1,200 price difference – is what separates it from its platform-mate, the Fiesta. A 1.5-liter engine, great brakes and a suspension that holds its own over torn-up city streets lead us to believe that the Mazda2 might be the best-driving subcompact at this price. If only the interior lived up to the drive quality. There are a touch too many hard plastics and not nearly enough tech features – odd, considering their tech-savvy target audience. But this is all part of Mazda’s big plan for the small car. They’ve set the price low and focused on the drive to rein in a different buyer – and that’s smart. Mazda made the drive a priority when developing the Mazda2, and it shows. Keeping trim levels simple – there are only 24 possible ways to build the car – will ensure the model you want will be sitting at the dealership. 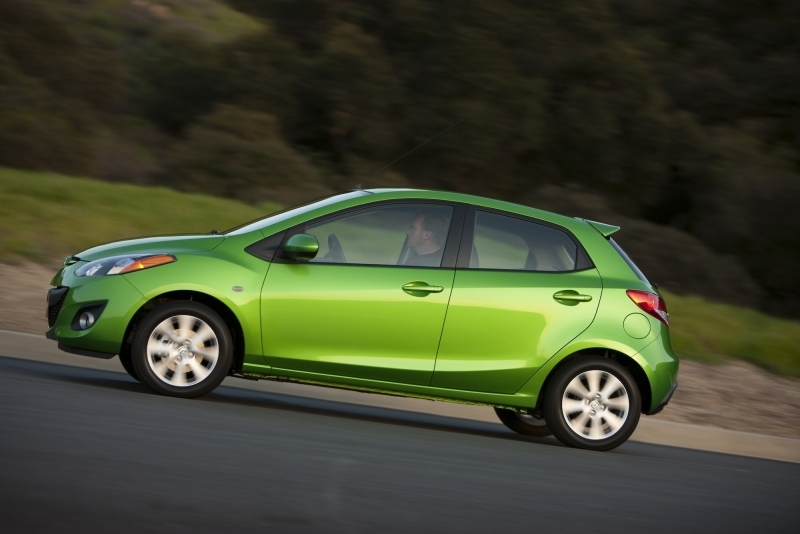 Pricing is spectacular, undercutting the Fiesta, Fit, and Chevrolet Sonic. Interior doesn’t hold a candle to others in the segment; fewer hard plastics would have made a world of difference. A lack of tech features that come standard on competitors – like Bluetooth and an iPod connector – means the Mazda2 is already outdating itself. Rear space is will be cramped for taller passengers. Performance of sub-compact cars is historically underwhelming. Even those with more power sometimes don’t know how to manage it. The Mazda2 has taken very little horsepower – 100, to be exact – and put it to work, delivering a solid drive. Weight reduction is the key here, and Mazda has shaved pounds wherever they could – it’s more than 200 lbs lighter than the Fiesta. As a result, the Mazda2 feels peppy and competent – with acceleration that won’t deter you from passing slow-moving tractors. The well-tuned suspension is forgiving without being sloppy and stays on-point in corners, which is helped by the remarkably true steering. 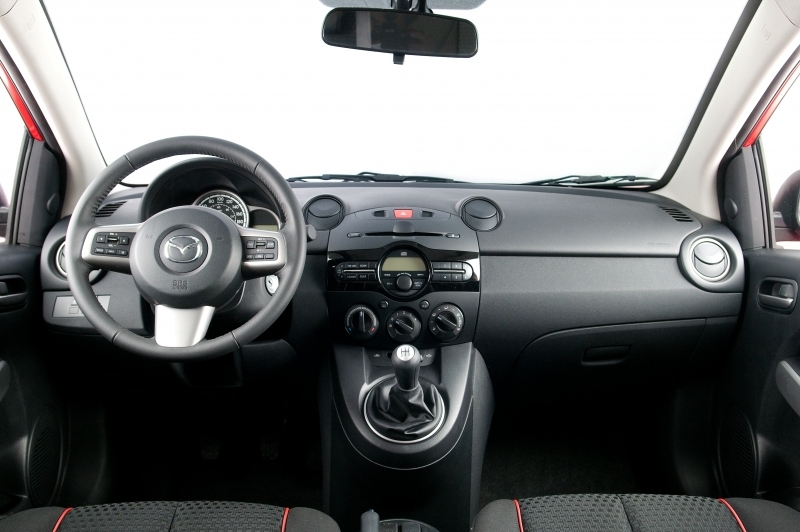 We encourage at least trying the five-speed manual; with an engine this small, swapping gears yourself adds more excitement to the drive, especially with the Mazda2’s proficient gearbox. If an automatic is your weapon of choice, Mazda has eschewed more gears (and thus more fuel efficiency) for longer ratios, and it seems to be the right choice for this car. As the sub-compact market grows, be prepared to see more small displacement engines like the Mazda2’s 1.5-liter inline four. It produces 100 horsepower and 98 lb-ft of torque, which seems meager until you get behind the wheel of this 2,300-lb lightweight. Both trims come with the choice of a five-speed manual or four-speed automatic. Most of the segment seems to have fuel economy numbers that hover in the high 20s, low mid-30s range, and the Mazda2 is no different. The manual returns 29 mpg city and 35 mpg highway and the automatic brings in 27 mpg city and 33 mpg highway. 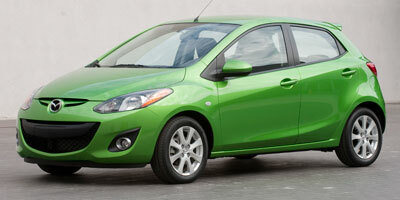 For the base price, the Mazda2 is considerably well appointed. Standard are an auxiliary input jack, center display, four-speaker CD/MP3 stereo and remote keyless entry. Opting for the Touring trim will add cruise control, steering wheel-mounted controls and a trip computer. Sun worshippers will lament the lack of a sunroof on either trim. You’ll find more comfortable interiors in the competition and an arm rest is only available for extra cost, but the Mazda2’s cabin space isn’t without its charms, namely those found in the center display and sporty red lighting. 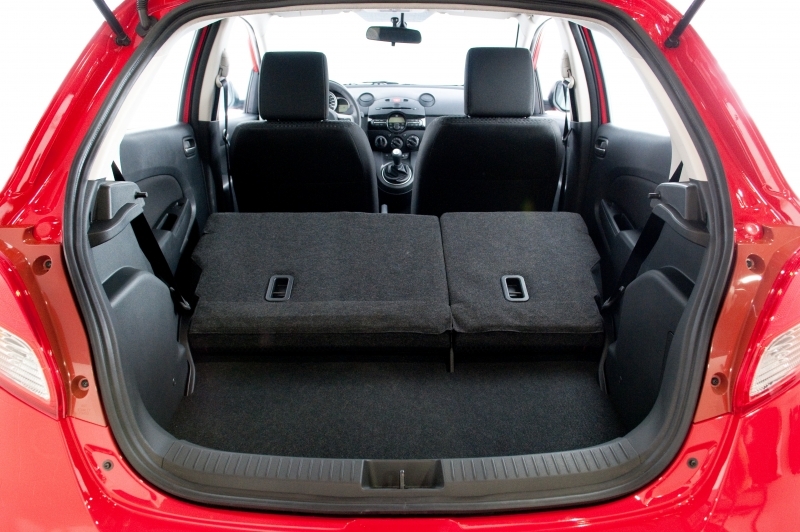 The 60/40 split folding seats give the Mazda2 more cargo space than the Fiesta. With nearly identical head and legroom numbers to cars inches longer than it, the cabin feels more spacious than you’d think. The Mazda2 is a full 27 inches shorter than the Mazda3 and adopts a toned-down version of the familiar nose and gaping grille. 15-inch wheels are standard and look plenty big enough for this diminutive car. Fog lights and a rear roof spoiler are added to the Touring trim to round out its look. Look elsewhere for a sedan body style as the Mazda2 is available only hatchback form – a very good-looking one, we might add. A key part of finally bringing the Mazda2 to the U.S. is keeping its base price securely below the Mazda3’s. In any of its 24 configurations, a Mazda2 won’t top $18,000 (unless you add every minor dealer accessory like wheel locks), and it starts at just $14,370 for the Sport and $15,855 for the Touring. As the segment grows, more competitive models go head-to-head with it, including the Chevrolet Sonic, Ford Fiesta Hatchback, Nissan Versa, Toyota Yaris Five-Door Liftback and Suzuki SX4. Overnight, the sub-compact car segment has seemingly doubled in size, which means the Mazda2 will need its strong performance, exterior styling and smart pricing to stand out from the pack. Many will still head to Ford and Honda dealerships, but it would be wise of those who place priority in performance and price to test drive the Mazda2.